"Robot, attack! Robot, destroy!" These commands launched a thousand sci-fi fantasies for budding fans of the genre, just as they brought Johnny Sokko's Giant Robot into imminent battle action! Under the voice control of young Johnny Sokko, the massive, flying metal behemoth would bring his fiery breath, laser eyes, finger-launched missiles and, above all, his physical strength into battle with countless menacing monsters bent on destroying the Earth! This epic fantasy series from Toei Studios aired from 1967-1968 and garnered even more fans in after-school reruns throughout the '70s. 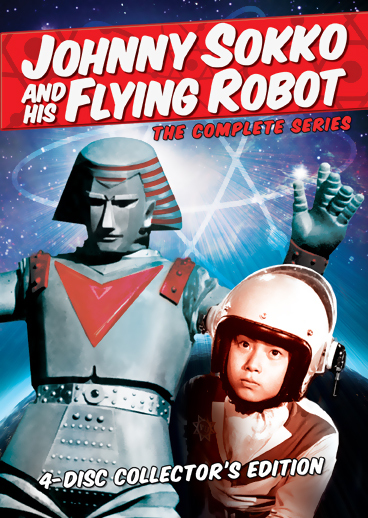 Collected here for the first time on DVD are all 26 episodes of explosive kaiju battles, nefarious alien takeover plots and mind-blowing heroics from jet-packed Johnny Sokko and his equally airborne friend and protector: Giant Robot!